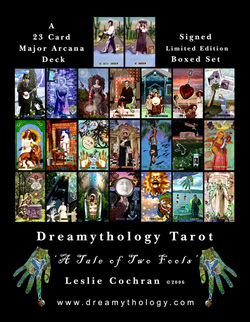 The hand made limited edition Dreamythology Tarot, by Artist Leslie Anne Cochran was first published in 2006. The deck of Majors evolved from four years work on the Tarot Art Calendars in collaboration with artist Arnell Ando. 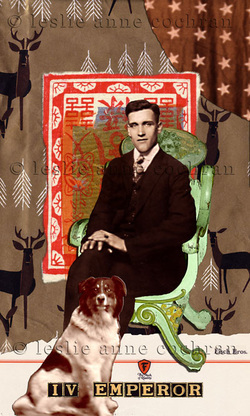 For each calendar from 2004 to 2007, the artists each chose 6 Tarot Majors to interpret using digital collage. With the completion of the 2007 Tarot Art Calendar, Arnell and Leslie created their own Tarot Majors decks. Leslie's Dreamythology Tarot is not currently available. 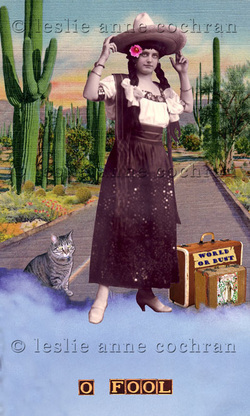 Dreamythology Tarot is on Tarotpedia and includes links to reviews.